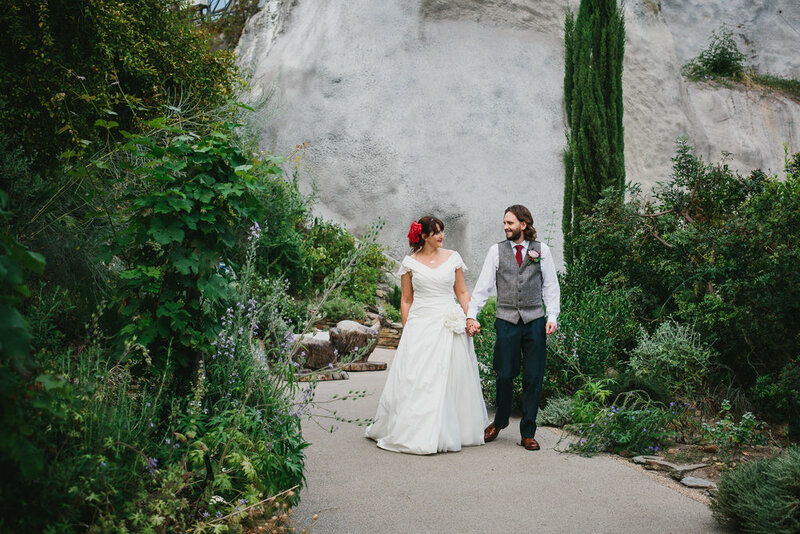 Rebecca and Paul were married on the 24th of July at the Eden Project. The day was colourful as it gets and filled with happiness and laughter. 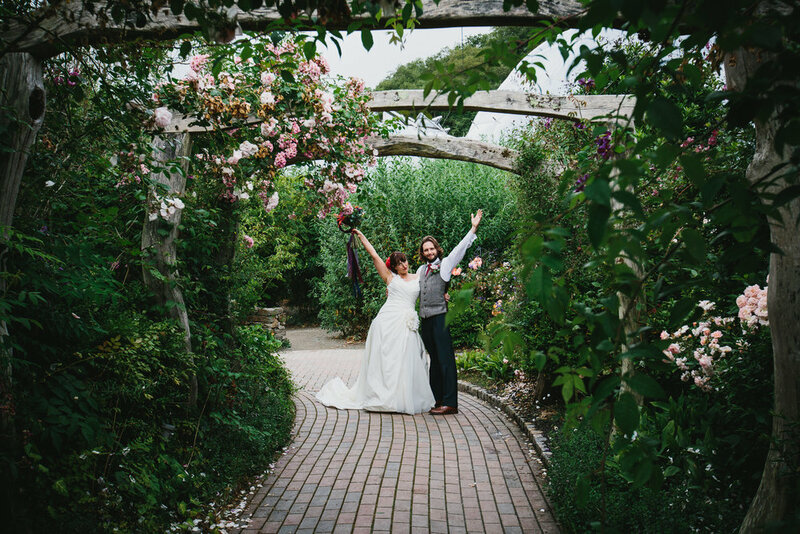 I was stoked when they asked me to do their photography as I haven't been to the Eden for a wedding before and as you can imagine it is a photographer's delight! 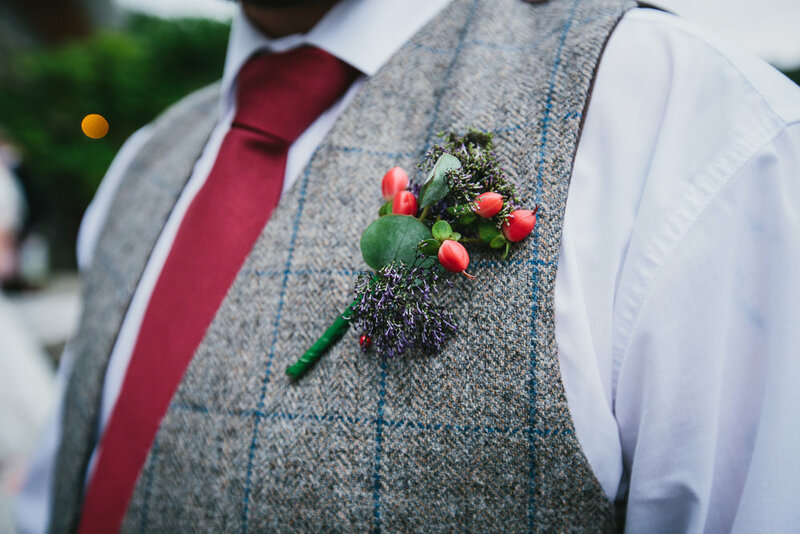 Rebecca is an event manager, so I wasn't surprised when everything went to plan and I found beautiful decoration and details to photograph. The flowers, one of the best I have seen this year (don't tell the other brides!) 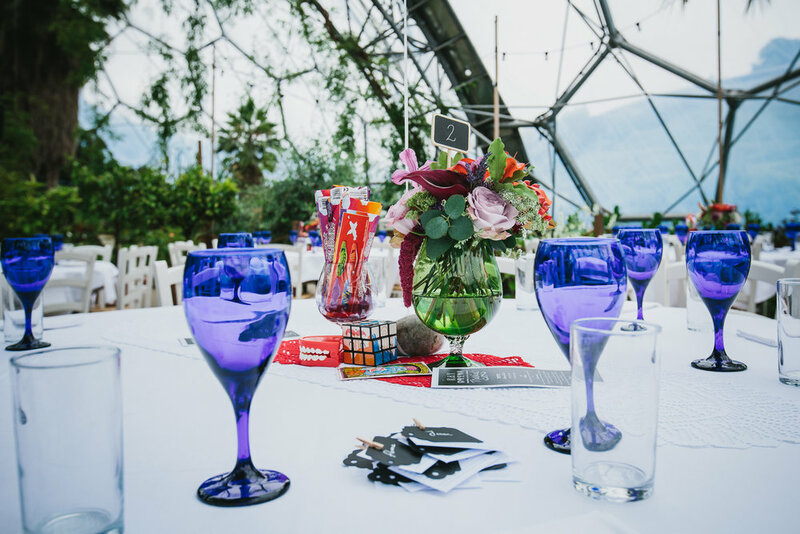 were provided by an in house florist and the lovely blue glassware by The Creative Crockery Company. 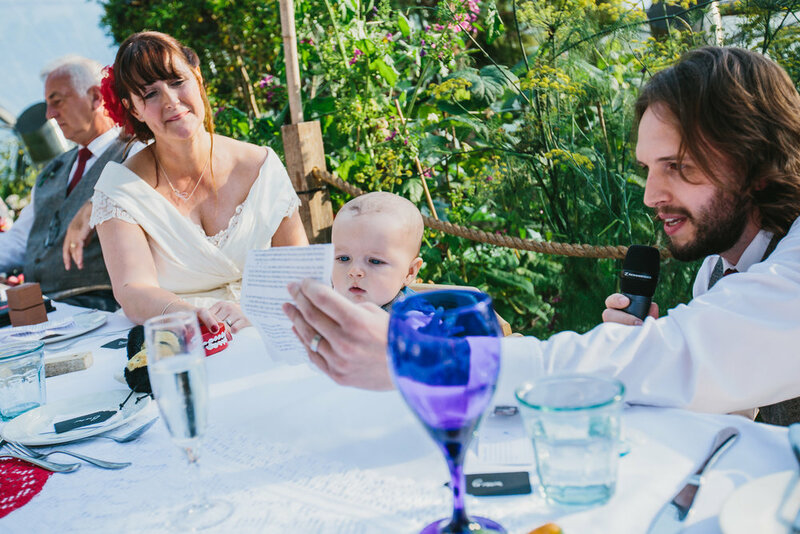 Rebecca and Paul are now proud parents of their little son Baxter since I last met them for their wedding consultation. And they are very excited to move to Falmouth in Cornwall end of August. To read more about Rebecca & Paul's wedding, please read Rebecca's own notes about their special day on the bottom of this page. here is just a small preview..
It’s not easy finding a perfect venue for your own wedding when you’re an events producer! It should be easy but the trouble is you know too much. 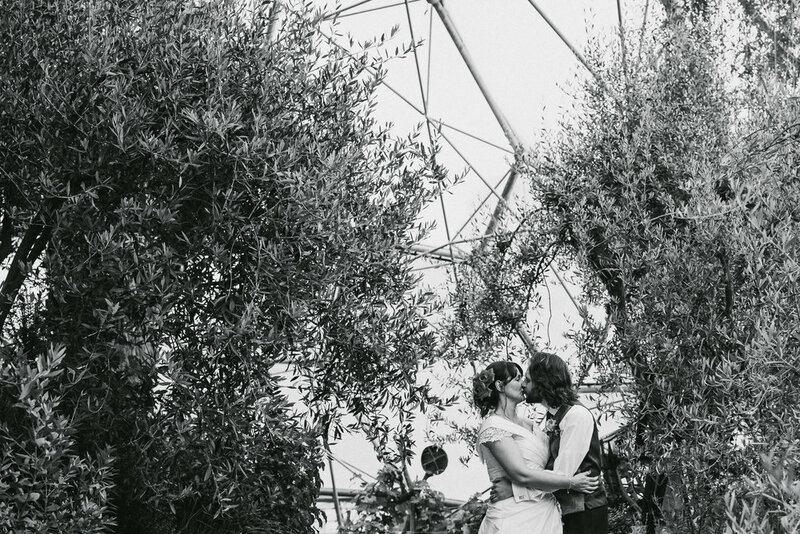 You know the pit falls with the beautiful DIY tepee weddings in the middle of a field. I knew we wanted something unique but at the same time I didn’t want to be working on my wedding day, worrying about the generator going halfway through the evening. 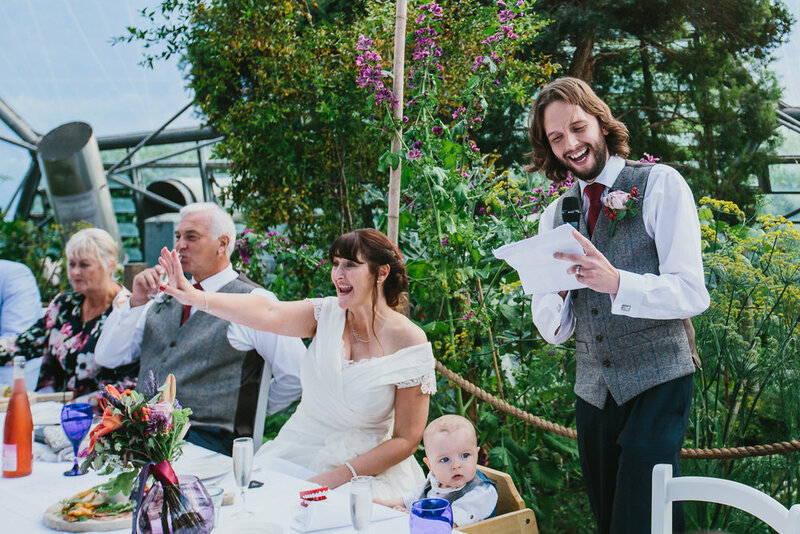 Paul and I got engaged whilst on holiday in France and really that framed our ideal wedding vibe. To us it was about having a fun, holiday, relaxed day / weekend, for all our friends and family. 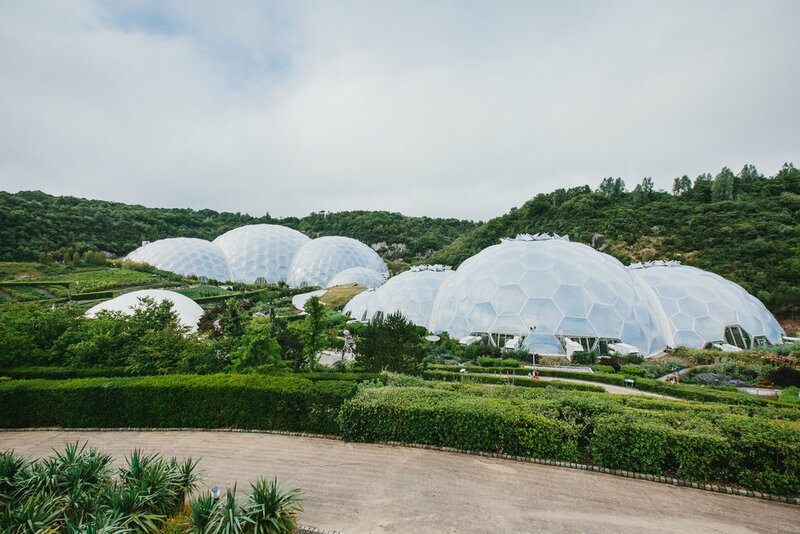 We knew it was asking a lot for guests to travel to France but we thought there are so many beautiful holiday destinations in the UK, Cornwall being one of the best. 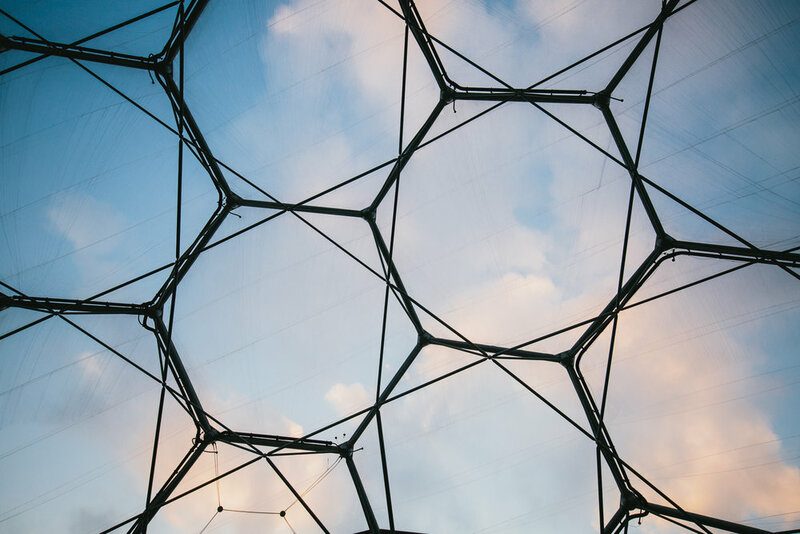 We therefore narrowed our search and once I spoke with the Eden project events team it was apparent that they were able to offer everything we were looking to achieve within our small – medium sized budget. The great thing with the Eden is that they do have great packages but they are also willing to work with you on moulding the day you want. 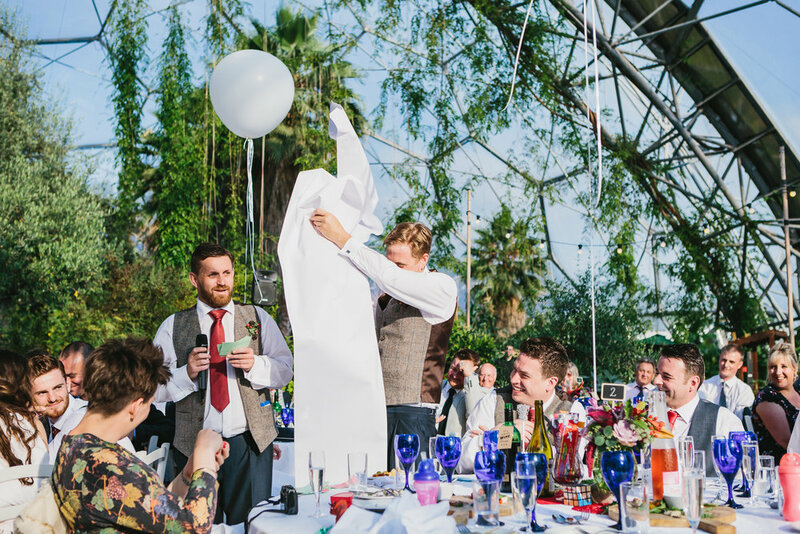 For example we felt asking guests to travel to our wedding for a ceremony that started at 5pm would be too much, therefore we hired the Gallery for our ceremony room and reception, I hired a draping company to create two separate rooms. Guests then took the land train down to the Mediterranean dome for dinner and dancing. The beauty with the Mediterranean dome is that you really don’t have to do anything to create the wow factor. I also know in my line of work that we didn’t need to force a theme or style onto this magnificent dome as it has a beauty of its own. 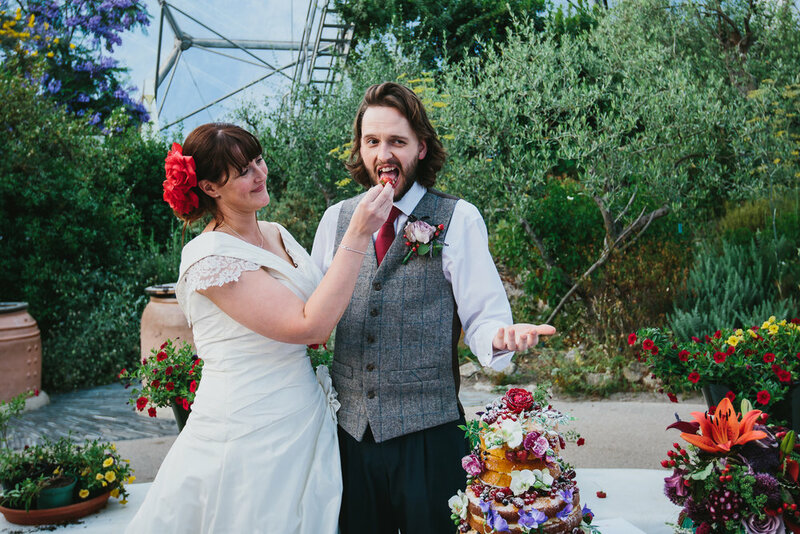 We wanted our wedding to have the vibrant colours of being on a holiday in the med. My bridesmaids were in dark blues and rich reds. 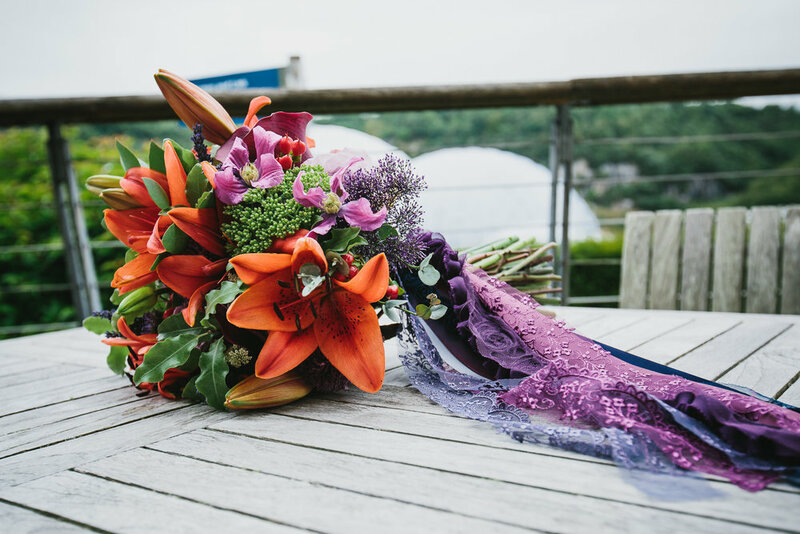 I had red nails and red flowers in my hair and the Eden project florists design the most beautiful floral displays and bouquets, with inspired red lilies, wild berries, and blush ranunculus. 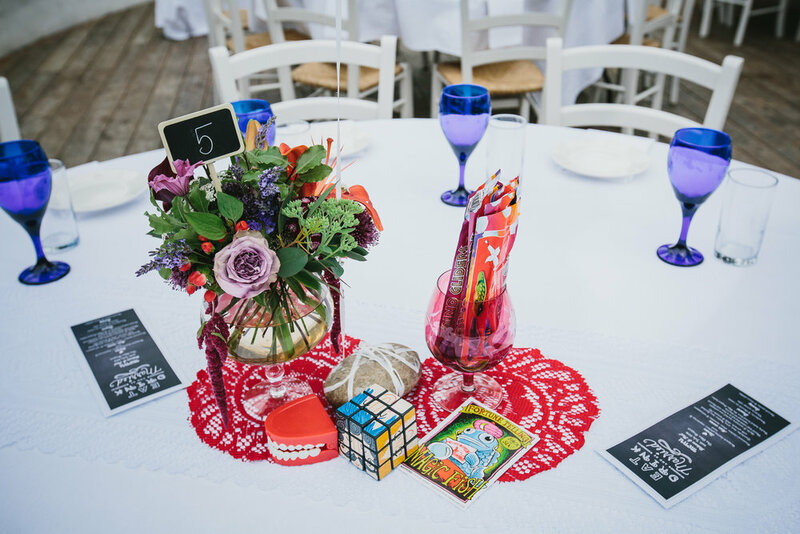 To carry the colour through to the dining tables we hired beautiful blue glasses, which made the tables pop. 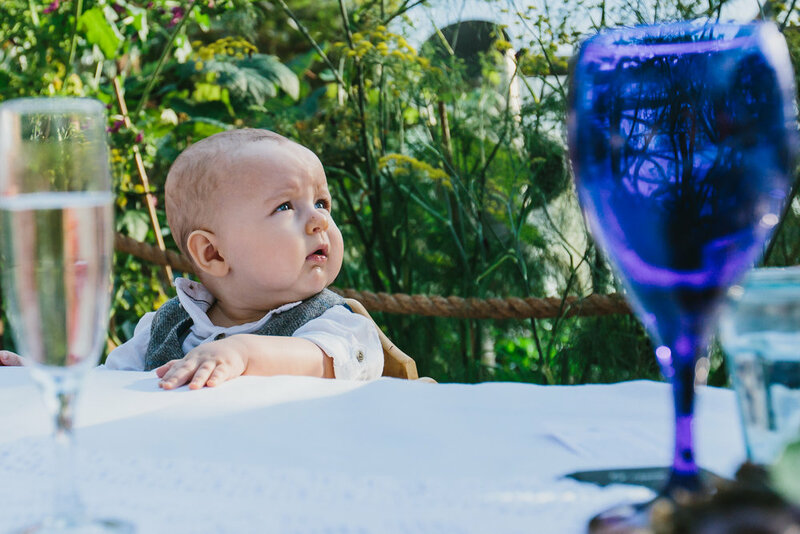 For the meal we had sharing platters already on the tables so guests could get stuck right in straight away, they were also a bit of a conversation starter. We were happy for people to munch whilst the speeches took place, giving a much more relaxed vibe for everyone. Our top table was actually a big long family table, with 16 of our noisy rabble, again to have a more relaxed atmosphere. For the mains guests went up to the open kitchen to choose from a selection of dishes, all cooked in front of them. This really added to our al fresco dining, holiday style. 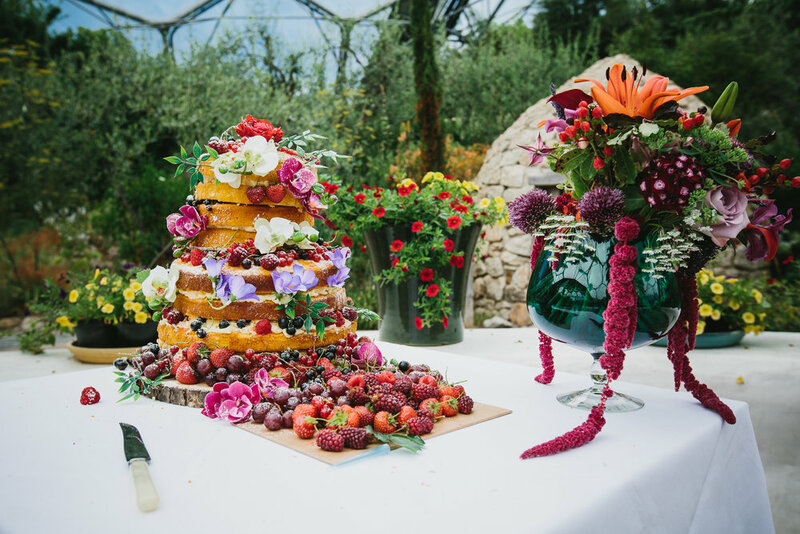 Dessert was summer strawberries and Cornish cream with the most amazing naked cake that was made by my wonderfully talented Aunt. My favourite bit was when our best men (we had 4!!) all went round all the tables, post dinner, offering shots of Limonchello, Sambuca & Caramel vodka, to signify the end of the dinner and the start of the party! For the party we were worried about getting the right balance for the music. Paul is a very big music buff and for him he didn’t want to hear someone else singing covers, he’d rather listen to a good DJ playing originals. I knew I didn’t want any old wedding DJ, they needed to be able to read the crowd and mix properly. 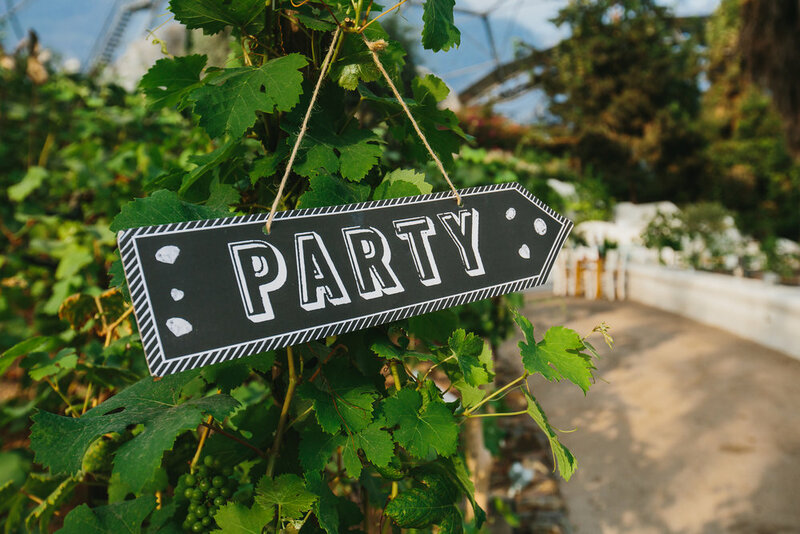 I had worked with Disco Shed previously and knew their DJ’s were the best and they provided something extra with their wow factor décor. It was money well spent as the dancefloor was never empty. 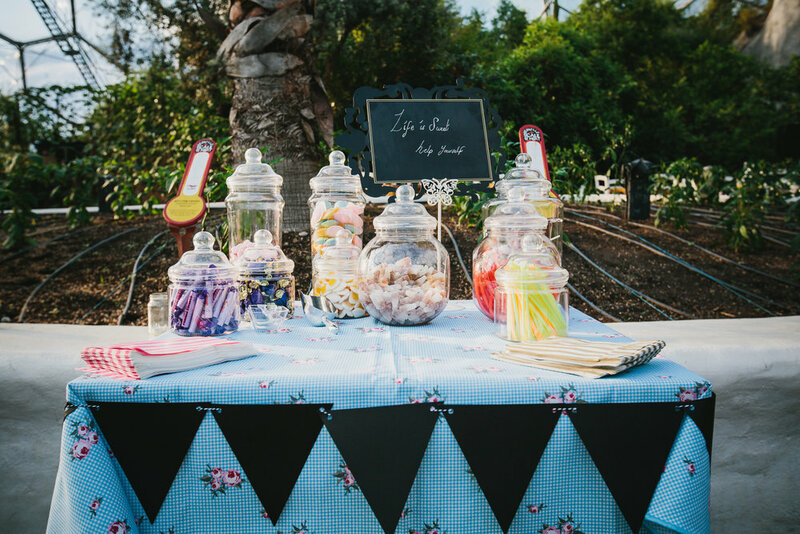 In terms of styling we did create our own Nachos table for guests to nibble on during the drinks reception & hired a retro popcorn stand. 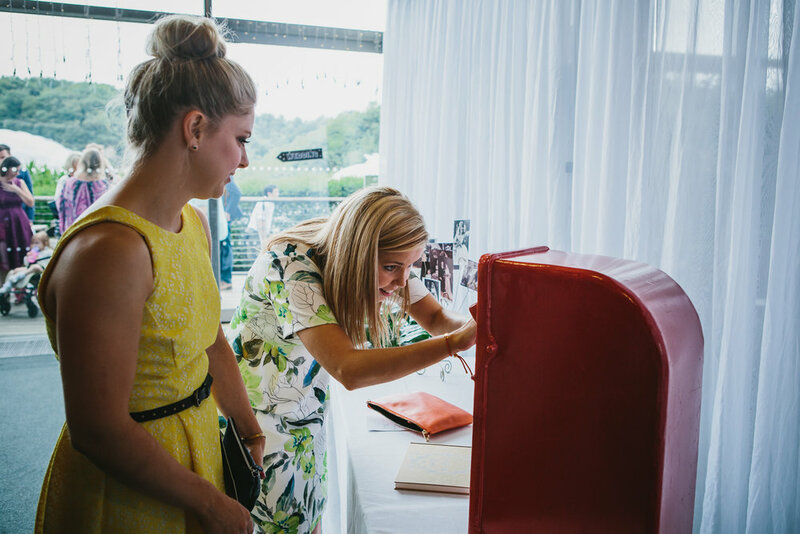 I also created my own lace photo booth back drop, which guests could take selfies in front of. We provided a sweet stand, grab a shawl trunk and little hangover kits of cookies and water! 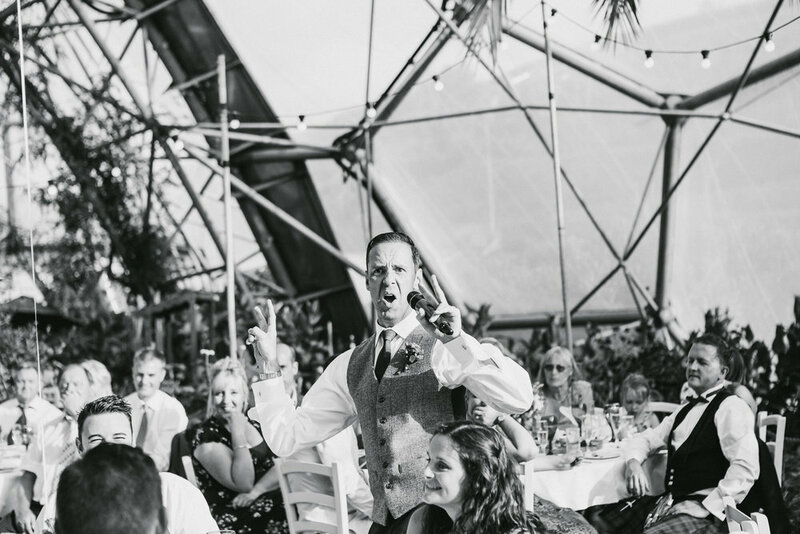 I think we knew we hit the right note when guests entered the dome and gasps were heard. We had several people saying they felt they were in Portugal or, as one guest said to me, in the film Mamma Mia.